The landscape design for New Ludgate unites two distinct buildings by reintroducing a historic existing alleyway and incorporating a new public ground-level piazzetta, whilst additionally developing a south-facing roof terrace on the development’s fifth floor. This terrace has dense and colourful planting, setting the standard for terrace gardens through London. 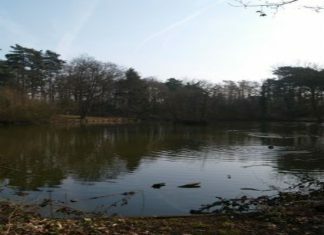 It provides important habitats for birds and bees, supporting biodiversity in the City. The piazzetta ties the new development seamlessly into the surrounding urban fabric qurg fine landscape details and finishes. The terrace comprises a dense planting scheme which varies in height and corresponds to an understated colour scheme for pockets of the raised flower bed, which is wrapped in a sinuous white Corian bench. 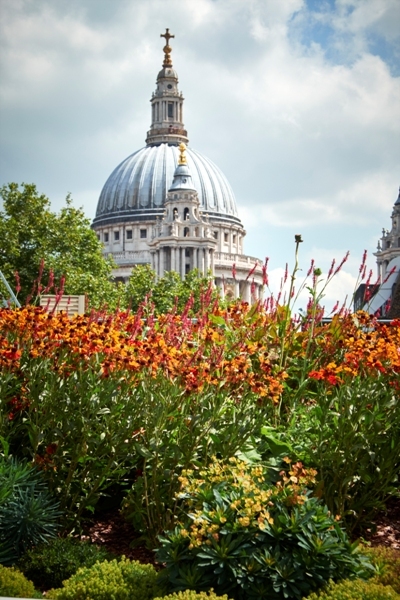 The design of the planting bed allows spectacular views for the building’s users to St Paul’s and the City of London beyond. Gustafson Porter’s landscape design for the public realm at New Ludgate ties the new development seamlessly into the City’s urban fabric and character. It responds to a brief to design streetscapes, a new alleyway and a small public piazzetta. The design draws on the history and context of the site, recalling similar hidden passageways in London, and opens a new additional West-East pedestrian route through the urban block. From the outset Gustafson Porter wanted to create a special character for the paving on the scheme, starting with the standard module of the City’s paving, and moving towards something crafted and unique. Through numerous hand-drawn design iterations together with 3D modelling, it possible to develop a set of 9 repeatable pavers which appear as a random pattern. The modularization and 3D development allowed the contractor, Gormley, to cut the stone with great precision. On the terrace, the design of the bench and planting bed was driven by a desire to screen the building maintenance unit. This sinuous white Corian bench, both inconspicuous and sculptural, uses an uncommon exterior material and forms a unifying element to the entire terrace. The moulded form gives it a fluid and organic quality, developed through 3D modelling. The rise and fall of the bench responded to varying soil depths, rising in the centre around the maintenance unit’s garage. Design development led to a bold geometric paving pattern which takes inspiration from fashion designer Alexander McQueen and the 20th century artist M. C. Escher. We were certain from the outset that we did not want to use a standard piece of paving on the scheme, and through lengthy design iterations developed a set of 9 mosaic pieces which give a crafted and unique quality to the space. 3D development allowed accurate stone cutting, reducing wastage on site, and improving quality control of the installation. On the roof terrace, the design of the bench and planting bed was dictated by the location of the window cleaning equipment, which we sought to disguise. Both inconspicuous and sculptural, this sinuous white Corian bench wraps around the very edges of the terrace whilst its varied height creates ample soil depth. The design of the planting bed opens up two spectacular views for the building’s users to St Paul’s and the City of London beyond. Gustafson Porter’s 3D design files were used by the manufacturer at construction stage which ensured a consistency in the realisation of the design from concept through to installation.